The Modelling News: Navals Ahoy! with AK interactive's new December items!! Navals Ahoy! with AK interactive's new December items!! Ahoy there land lubbers! Christmas time and its time to get your navals out – your ships we mean – but what to weather them with? 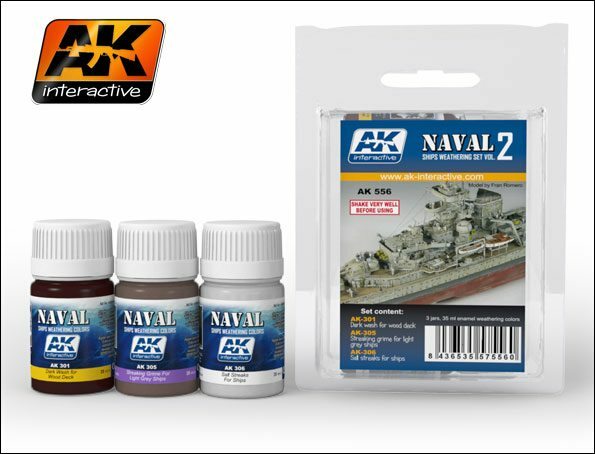 Well AK Interactive has just released a great new range of weathering stuff for ships – combined with new releases of artist quality watercolours, some great track weathering sets and of course where would you be without a pre-ty nice looking calendar to keep your builds on schedule for the next year? The six new colours included in this paint set are specifically designed to aid the modeller in creating a realistic appearance for all types of wheels and tracks. The set includes a Darker Black colour with a satin finish to represent new tires, while the wear of older tires is represented by a Dark Grey colour. 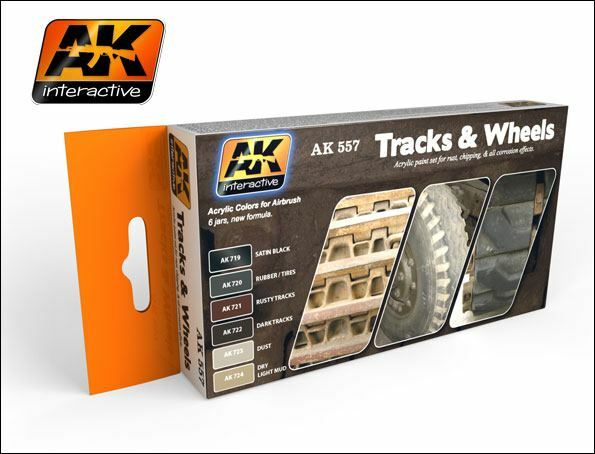 Also included are two new shades of track colours; a Light Rust colour to represent fresh rust as might be observed on the tracks of an abandoned AFV, and a Dark Tracks that accurately creates the appearance of operational treads. Finally, we provide two tones, Dry Mud and Light Dust, which will allow you to dirty and dust your wheels and tracks easily for a natural appearance. 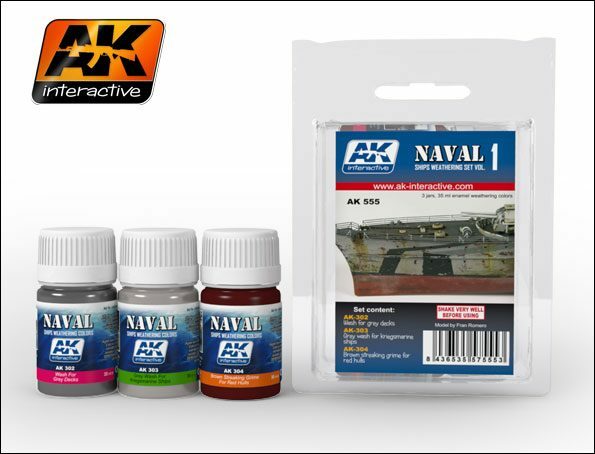 These acrylic colours are designed for use with both brush and airbrush and are water soluble for odourless painting and require no aggressive solvents for clean-up. Our acrylic paints are manufactured by AK Interactive and made with a formula that prevents clogging in your airbrush. 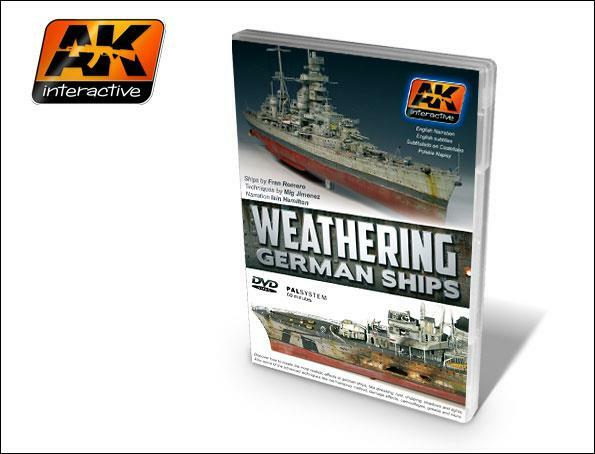 With this DVD, the modeller fan of ships and warships will learn how to weather their ships in a realistic, simple and effective way. In a very visual step by step the modeller will see how to obtain give to our ships the worn look so characteristic of any ship after some days at sea. The DVD covers different techniques and types of wear, from simple to complex, from a ship after few days on sea to another almost completely spoiled by the sea. Although the DVD focuses on warships of the Kriegsmarine, these techniques can be applied in any ship and even useful for other topics. 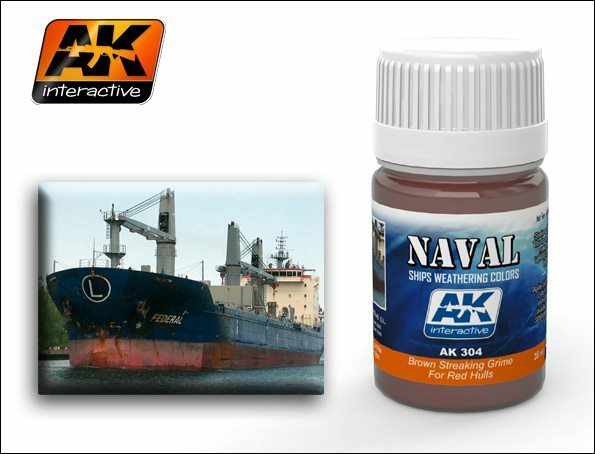 This set contains the products AK-302 Wash for grey decks, AK- 303 Grey wash for Kriegsmarine ships and AK-304 Brown Streaking Grime for Red Hulls. 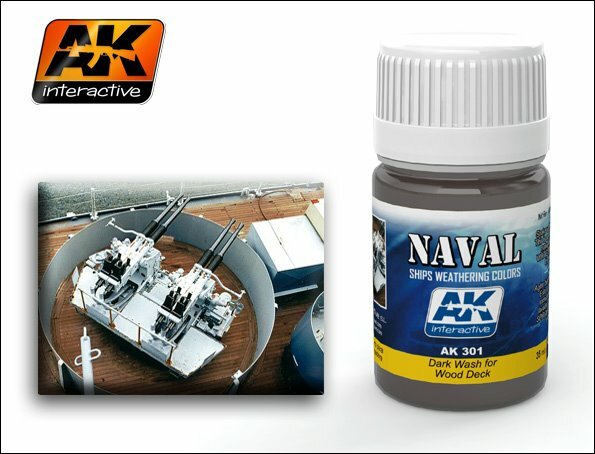 This set contains the products AK-301 Dark wash for wood deck, AK-305 Streaking grime for light grey ships and AK-306 Salt Streaks for ships. 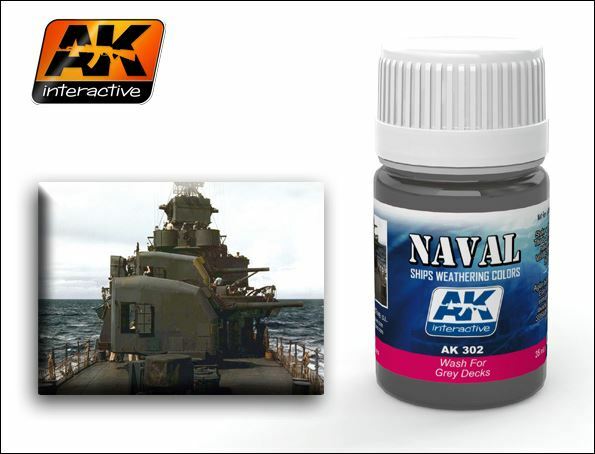 This enamel wash is specially designed to bring out the details in grey warships typical of many nationalities from the Kriegsmarine, United States Navy, or Imperial Japanese Navy. Also it can be used in other subjects such as aircraft or grey tanks. 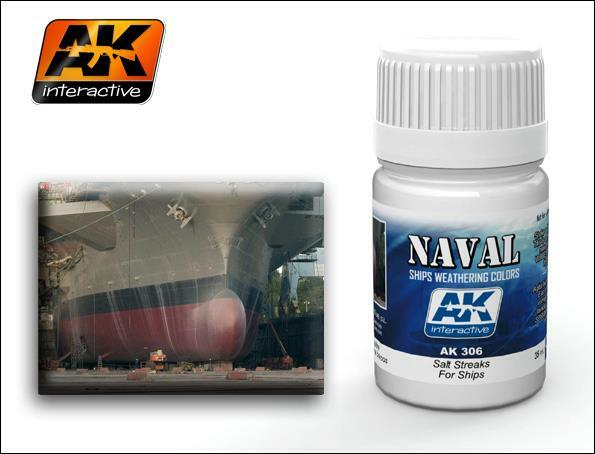 With this enamel product the modeller may easily represent streaking effects left by salt on vertical surfaces of any ship. 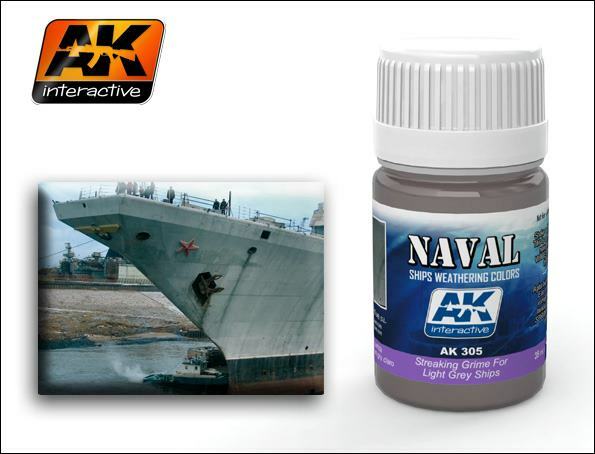 With this enamel product the modeller may easily represent streaking dirt effects on ships painted in light grey. It can also be used on other issues of similar colour such as aircraft or AFVs. With this enamel product the modeller may easily represent streaking dirt effects on ship hulls painted in red primer. It can also be used on other issues such as the hull of a tank. 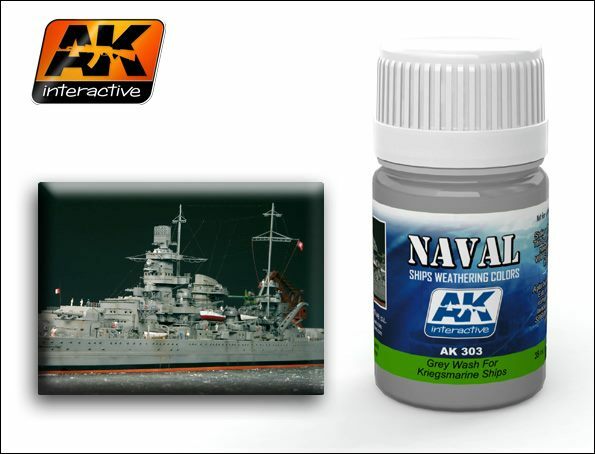 This enamel wash is specially designed to bring out the details in the colours of a scale ship of Kriegsmarine. Also it can be used in other subjects such as aircraft or AFVs with a grey finish. Light grey artist quality oil. Ideal for wear and fade effects in grey surfaces, change the tone of an area, add depth, give a greyish colour to a part or simply mix with other enamel or oil paints. Dark grey artist quality oil. Ideal for wear and fade effects in grey surfaces, change the tone of an area, add depth, give a greyish and dull colour to a part or simply mix with other enamel or oil paints. Dark grey artist quality oil. Ideal for wear and fade effects in grey surfaces, change the tone of an area, add depth, give a dark aspect to a part or simply mix with other enamel or oil paints. 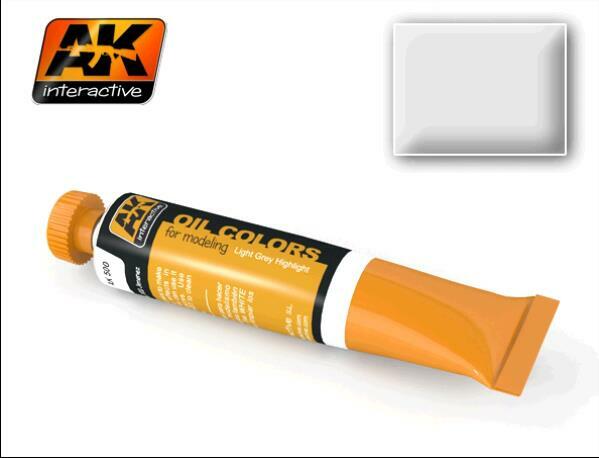 Light orange artist quality oil. Ideal for rust effects, change the tone of an oxidized area, give a piece a rusty aspect or simply mix with other enamel or oil paints. 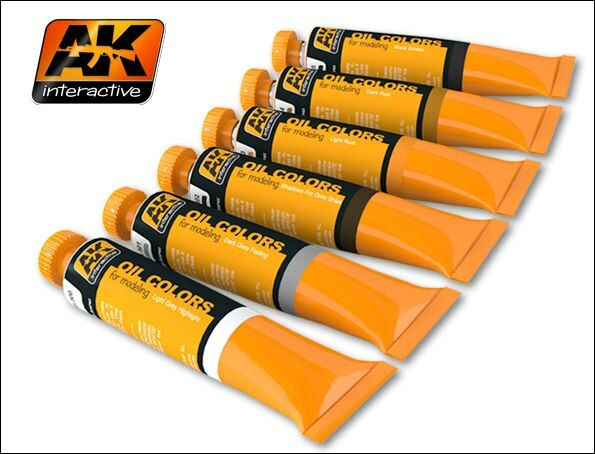 Dark orange artist quality oil. Ideal for rust effects, change the tone of an oxidized area, give a piece a rusty aspect or simply mix with other enamel or oil paints. Artistic oil quality black colour. Ideal for smoke effects, accent the dark of washes in darker areas, obscure areas of a model or simply mix with other enamel or oil colours. The calendar that will accompany the modeller during 2013. Our model Akatsiya will help you each month to remember key dates and give us that extra motivation to finish our models. 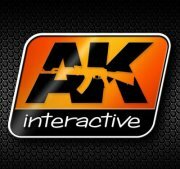 Terms and conditions are all at the AK Interactive site - along with all the info on all of thier other great stuff!